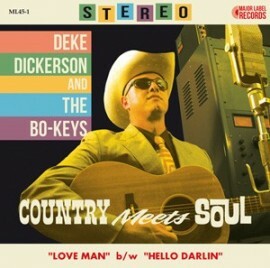 A brand new country-soul 45 with Deke Dickerson backed by the mighty BO-KEYS from Memphis, Tennessee! This cool two song 7" includes "Love Man" b/w "Hello Darlin'." Also features Joel Paterson on steel and Kelly Hogan on backing vocals. Vinyl 45 comes with free mp3 download card!